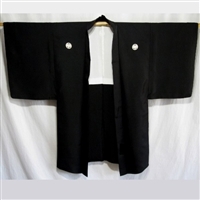 Men's haori are typically a single, dark color on the outside, and formal versions have one to five family crests. The inside linings of the most formal versions reflect something about the personality or interests of the original owner with elaborately painted, printed or woven designs. Our haori are displayed inside out, and can be worn or displayed either way.